For Recruits convention, I'm running (again) Axles and Alloys. This time, instead of a race, the scenario is a demolition derby. To play test the game, Bill, Ken, Jeff and I picked out three cars and set them up. I also created three new cars: Rhino, Bombardier and The Griswald. They were an experiment in vehicles geared for ramming more than firing. 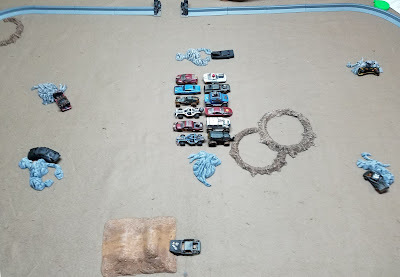 At the start of the race, the vehicles were lined up rear bumper to rear bumper. 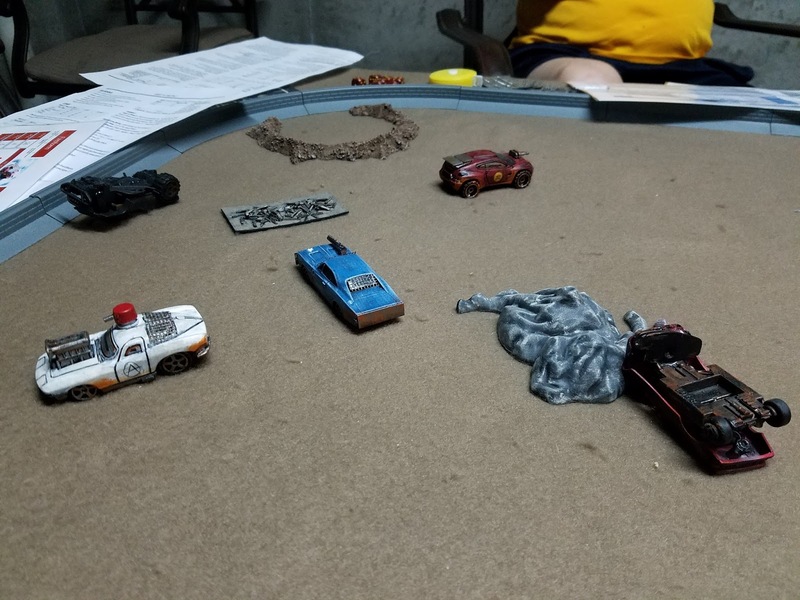 The first turn, the vehicles were required to accelerate at top speed from the center and couldn't fire any weapons (including droppers). 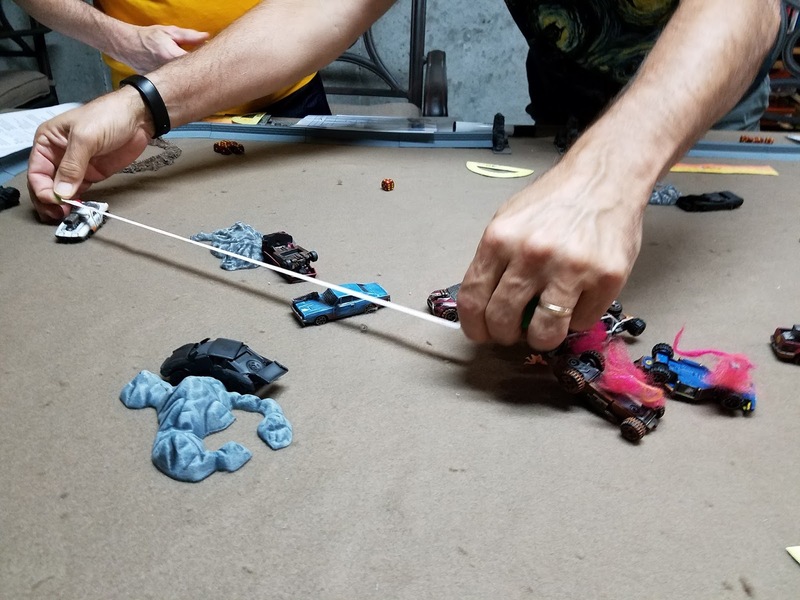 They were, however, allowed to bump each other. Things didn't go smoothly for the light vehicles during the first turn. 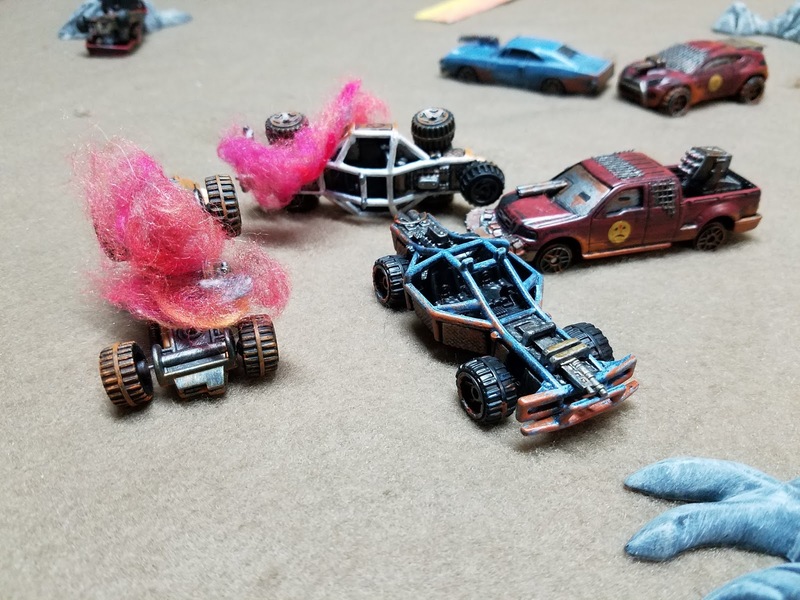 A couple of cars decided to play the part of pinballs and were unceremoniously damaged enough to explode their fuel tanks. 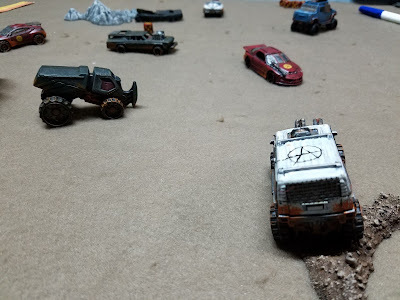 After the initial chaos that is so much a part of this game, things settled down a bit. The following pics will give you a feel for how the game turned out. 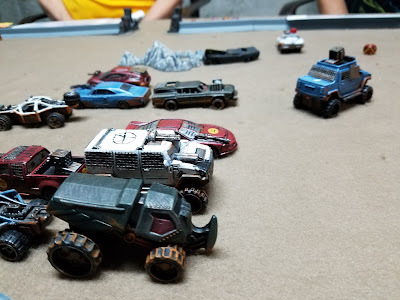 By the time we called the game, there were five to the initial 12 vehicles still in play. Some of these were very close to decimation and were literally rolling death traps for their drivers. 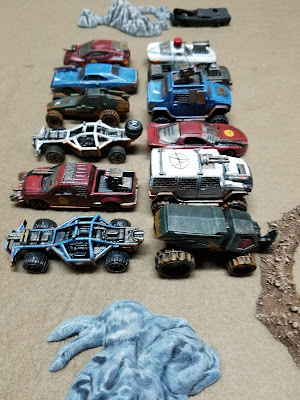 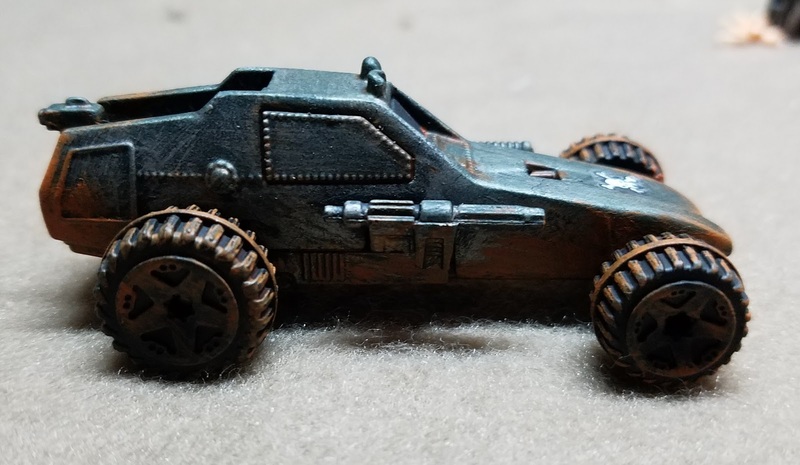 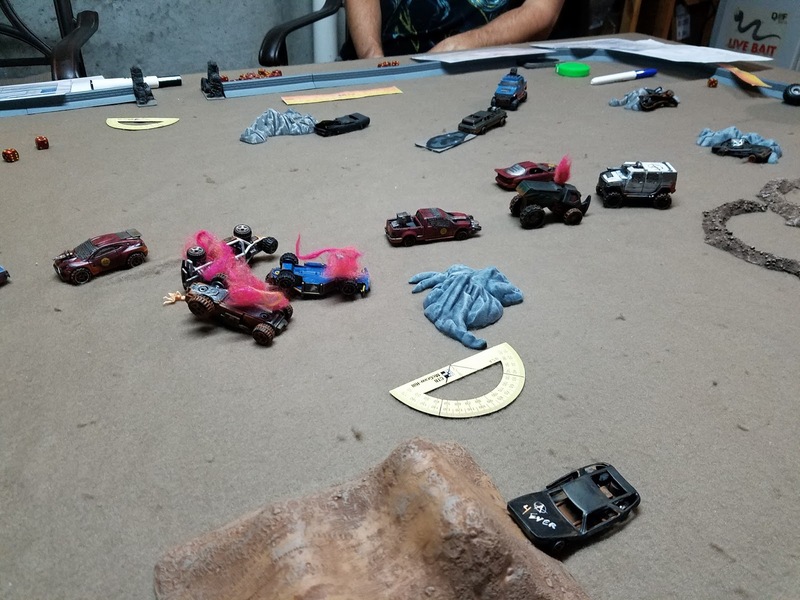 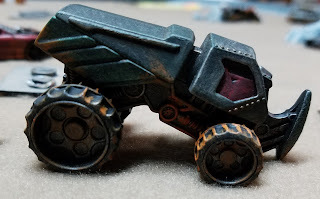 Other than changing where terrain was located on the course, everyone felt that the rest of the rules put in place the first turn were adequate for a demolition derby and would work well at the convention. 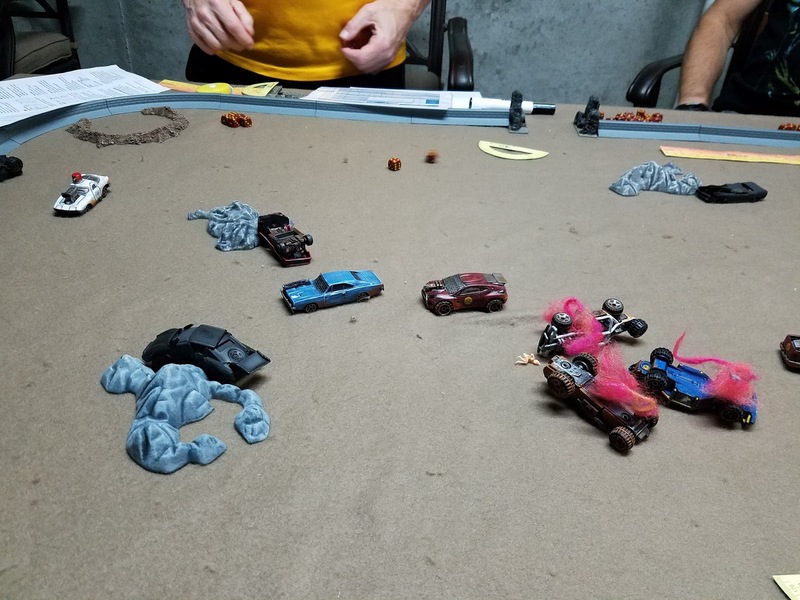 Alas, with only four players each playing three cars from the same color, 'team play' was inevitable. 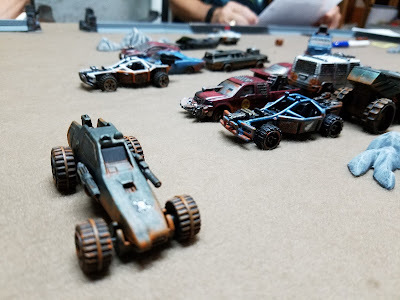 I made a note to remind the convention players that even though there were cars obviously from the same factions, there weren't 'teams'. 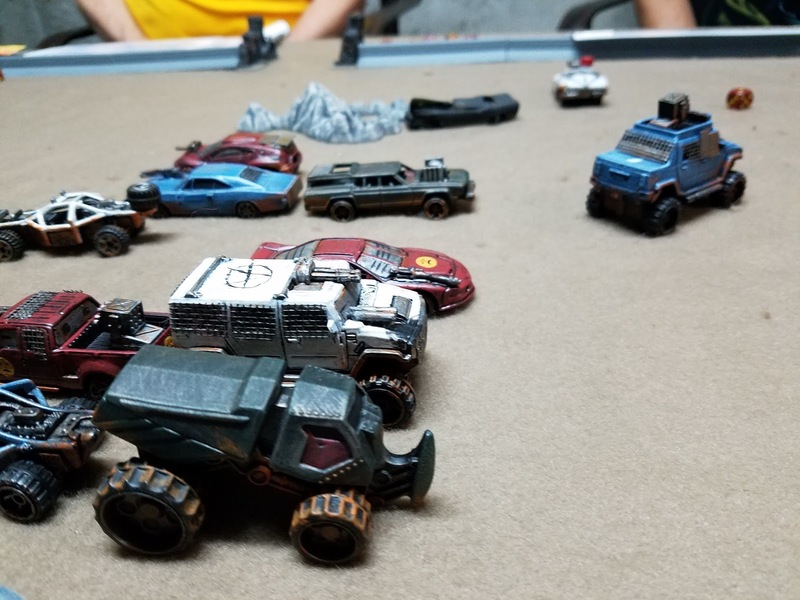 There could be temporary alliances, but ultimately there's only one winner in a demolition derby. Thanks for reading and I'd like to thank my play testers!